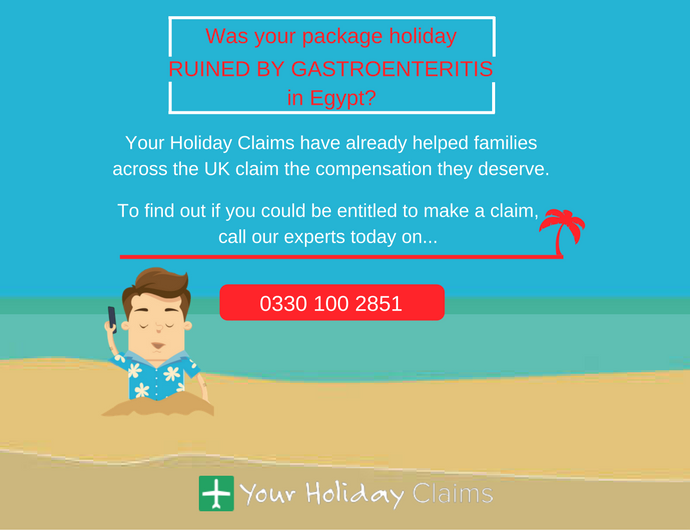 A St Helens holidaymaker has successfully received over £3,000 in a no win no fee claim for food poisoning in Egypt thanks to the expert team at YourHolidayClaims. YourHolidayClaims client, Keisha Green (21) and her partner (26) travelled to the five-star Grand Hotel in late August 2014 to celebrate their three-year anniversary. Unfortunately, it soon became apparent to the young couple that all was not well at the clifftop resort. Just days into what should have been a relaxing and romantic stay, Keishas partner was struck by the crippling symptoms of gastric illness and was placed onto an IV drip. Things soon went from bad to worse for the holidaying couple as on the penultimate day of their ruined stay, Keisha too began to experience the classic signs of gastric illness accompanied by fever and a skin rash. Despite seeking medical treatment in resort, Keisha remained unwell on her return home and claims to have endured a particularly unpleasant return flight. Upon her return to the UK and still suffering from ongoing symptoms, Keisha immediately contacted tour operator Red Sea Holidays to inform them of her complaints only to receive no response. Undeterred, the St Helens holidaymaker approached industry leaders YourHolidayClaims for specialist legal advice and resolved to pursue a claim for food poisoning abroad. Acting on a no win no fee basis, expert travel law solicitor Sue Robinson successfully negotiated a £3,600 compensation pay out for Keisha after issuing court proceedings against tour operator, Red Sea Holidays. Sue was also able to negotiate a settlement of £3,000 for Keishas partner, equating to a combined compensation total of £6,600. Commenting on the case, Sue said: âIt was my pleasure to help. No holidaymaker should accept illness as part of their package deal. âEgypt is, and continues to be a holiday illness hotspot. Here, at YourHolidayClaims, we are committed to helping British holidaymakers claim the compensation they rightfully deserve and would encourage anyone else who has been affected by illness on a package holiday within the last three years to come forward and seek legal advice. With over 50 years experience in travel law and an unrivalled claim success rate, YourHolidayClaims have the skills and background knowledge to help you receive the maximum compensation following illness on your package holiday. To discuss your case with Sue or any one of our expert advisers, call 0330 100 2851. Or, if you don’t have time to talk right now, you may want to start your claim online.